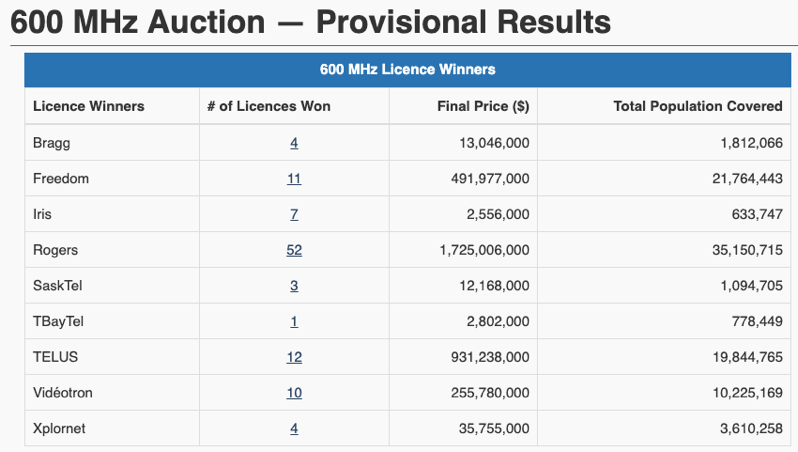 Innovation, Science and Economic Development Canada has announced the conclusion of their 600 MHz wireless spectrum auction, which generated $3.47 billion for the federal government. The auction began on March 12, 2019 and concluded on April 4, 2019. There were 12 qualified bidders to participate, but in the end, nine companies acquired licenses, with big players dominating, specifically Rogers. Rogers nabbed 50% of licenses, taking 52 at the cost of $1.72 billion, while Telus took 12 at $931 million, Shaw’s Freedom Mobile took 11 at $491 million and Videotron with 10 at the cost of $255 million. With 600 MHz spectrum signals, they carry further over long distances and can penetrate buildings better than higher-frequency bands, making it beneficial for rural and urban environments, according to ISED. Bell has spectrum assets in the low, mid and high frequency bands in both urban and rural locations. Given the supply of other low-band spectrum that Bell already possesses, 600 MHz is not required for Bell to deliver broadband 4G and 5G services. Similar to Bell, the company’s main U.S. peers chose not to own any 600 MHz spectrum in their markets.